Do you find that the Internet can lead you on wild goose chases? Or in this case wild carrot chases? 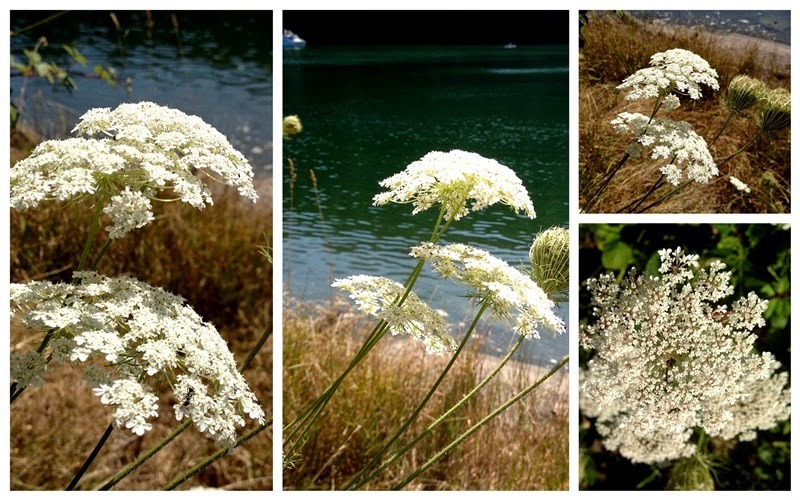 I looked up Queen Anne's Lace and found all sorts of weird and wonderful folklore and uses for the plant. I just think it's pretty. Especially growing beside the water. Two collages - the first in Picasa, the second in BeFunky. I like them both. That little boat in the top left corner of the water photo - that's our Solitude. We've had such peaceful, relaxing times on the water these past couple of weeks. Seems a shame to go back to real life. Judith of Lavender Cottage Gardening is the new host of Mosaic Monday. Thanks to Mary who hosted for so long and to Judith for picking up the torch. You have captured the essence of tranquility with these collages. I did not notice the boat until you mentioned it. So, so nice. Hello Lorrie, I agree the Queen Anne's Lace is pretty. I have been noticing more and more of it around.. Lovely images.. Enjoy your new week ahead! Beautiful!!! I love Queen Anne's Lace! Oh what beautiful captions of a lovely flower! Thanks for sharing. You did a great job. Thanks for visiting my post. I know it's early to think about Christmas. But check out the links they are up lifting. I try and write one post each week that is up lifting. Our fields are full of QA lace right now and it does look very pretty against a body of water. Looks like we were both on the same wave length today with Queen Anne's Lace. :) Isn't it a marvelous flower? (I can't bear to think of it as a weed) I have always loved it. Your mosaics are really pretty, Lorrie, and so is your boat!! I love its pretty shade of blue, and I know, from reading your posts, that you've really enjoyed it this summer. I hope you have a great week! Love Queen Anne's Lace, such a pretty and delicate flowers. I've never heard of BeFunky, have to go check it out! Queen Ann's Lace is such a delicate looking flower, isn't it? I love it in a mixed bouquet. I love Queen Anne's lace! I love photo collages--am familiar with Picasa, but haven't heard of the BeFunky site before. We call it Lady's lace here, such a pretty plant. I'm learning how to do a collage.....slowly! Oh I love Queen Anne's Lace too, it's so pretty in the garden mixed with any manner of flowers and colours. I have a different one - mine is very tall and the flower heads are huge, I especially like it mixed with cosmos, roses and lavender. 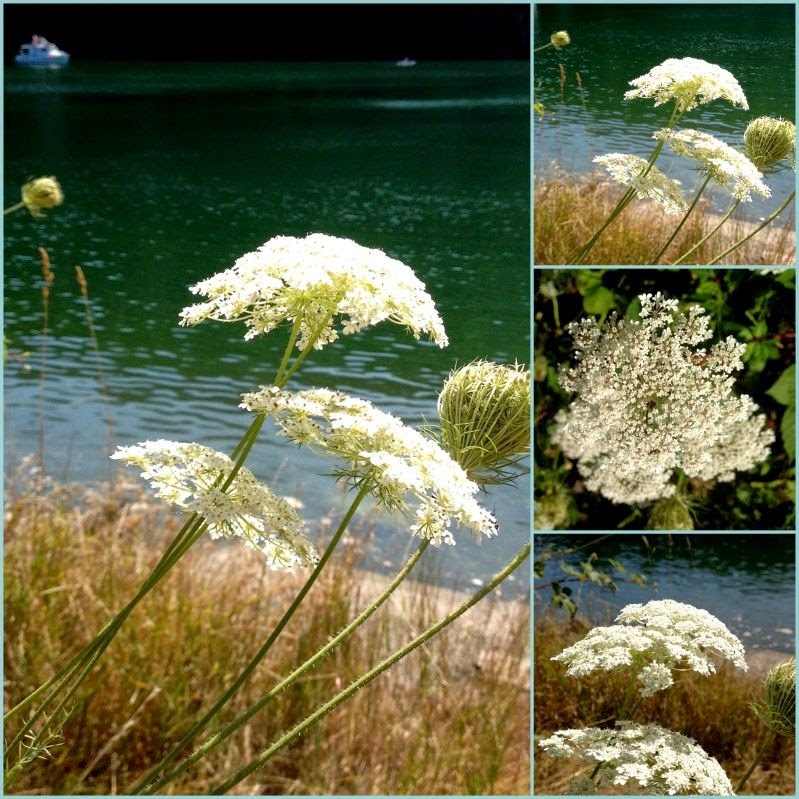 We love to put Queen Anne's lace into a glass of color water and watch the flower head change color! I was also interested to learn that it is wild carrot (my daughter taught me that!) and that people sometimes mistake hemlock for Queen Anne's lace! I love queen anne's lace. Usually stop by a roadside and pick some for the house. Loveyour photos! I love Queen Anne's Lace, but don't think it grows up here. I've only seen it further south in the state. Up here we have yarrow. Not as pretty. :-) The images in your mosaics are beautiful and calm-inducing. Just gorgeous! I love this bloom. We saw fields and fields of them in the Colorado mountains and countryside this summer. Not enough moisture and too hot for them here in NM. Beautiful job on both collages! That is one of my favorite wild flowers, and I'm delighted that it grows freely in the empty home lots in our neighborhood. This flower loves flowering around my meadow and gardens...I find it gorgeous and it looks wonderful in a vase. Love the collages especially the second one. I always want to pick a bouquet of Queen Anne's Lace, but it is more beautiful in the wild. Yes, I have to remind myself each time I am tempted. It's one of my favorite flowers. Your photo gives me a great feeling of peace and tranquility. Great shot.